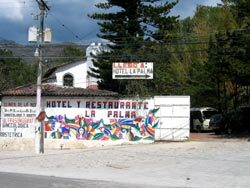 La Palma is located in the western part of the department of Chalatenango at 82 km from San Salvador and 8 km from the border El Poy which separates El Salvador and Honduras. Everybody refers to La Palma as being the town where art Naif was born. 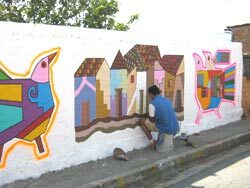 Naif is a kind of colorful painting on wood, creation of Fernando Llort (He also designed the ceramic tiles on the facade of the Cathedral in San Salvador). 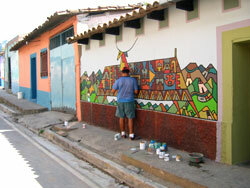 There are many workshops where wood, leather, ceramic, seeds, and cotton ware handicrafts are made using his same style. 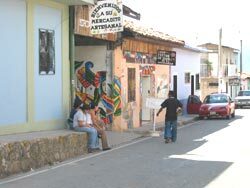 Besides being well known because of its handicrafts, La Palma became center of attention in 1984, when the former president José Napoleón Duarte met with guerilla leaders, in the very first attempt to end the civil war, which had started four years earlier. La Palma is a very popular touristic destination; there are many hotels and restaurants, as well as trekking areas. 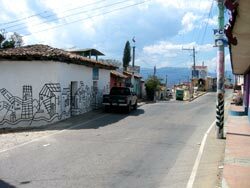 La Palma used to be part of the route called "Caminos Reales" (Royal Paths), which could only be reached through Honduras. Ever since La Palma gained its independence it's been place of numerous national battles, when the municipality and governmental armies fought the rebellious former president Francisco Malespín, Malespín was defeated in both battles. A mountain hotel at a height of 2400 meters. More than 60 years of history.